Ross County Football Club recognises the essential work of charities and community groups across the Highlands and Islands, and beyond. The club acknowledges the positive impact that RCFC can have to help generate support for such good causes. RCFC has always supported, and continues to support, a wide range of charitable and community activities. In order to more effectively fulfill and manage RCFC’s commitment to being a community facing football club, RCFC now have a recognised charity partner in the Ross County Foundation (TRCF). The Foundation is a registered charity (Charity No. SC045500) based at The Global Energy Stadium. This charity operates independently to, but in close partnership with, RCFC. The Ross County Foundation exists to provide support and change for the better in the Community. At present TRCFC provide this support directly to around 3,000 people every year by delivering community focused programmes and initiatives targeted at the following 5 strands: Positive Activity; Health & Wellbeing; Equality & Inclusion; Good Citizenship and Learning. Ross County Football Club work in partnership with TRCF to deliver these charitable activities which are focused primarily within the highlands and island of Scotland and are delivered to those individuals and organisations identified as being ‘in need’ of such help. The Ross County Foundation (TRCF) and Ross County Football Club are committed to delivering charitable assistance where practicable and appropriate. Any such assistance provided is aligned to the significant charitable work already being undertaken by TRCF, with the ongoing support of RCFC. Every genuine request for a charitable donation is worthy of our support. TRCF and RCFC would like to be in a position to support every request. Unfortunately this is simply not possible due to the level of demand. Throughout the course of each football season TRCF will make available items of signed RCFC memorabilia, which will be distributed for use by fundraisers to generate revenue for their own good causes. In order to effectively control the distribution and to potentially increase the eventual monetary value to the recipient charity, these donations are now limited to a set number of donated items per month. 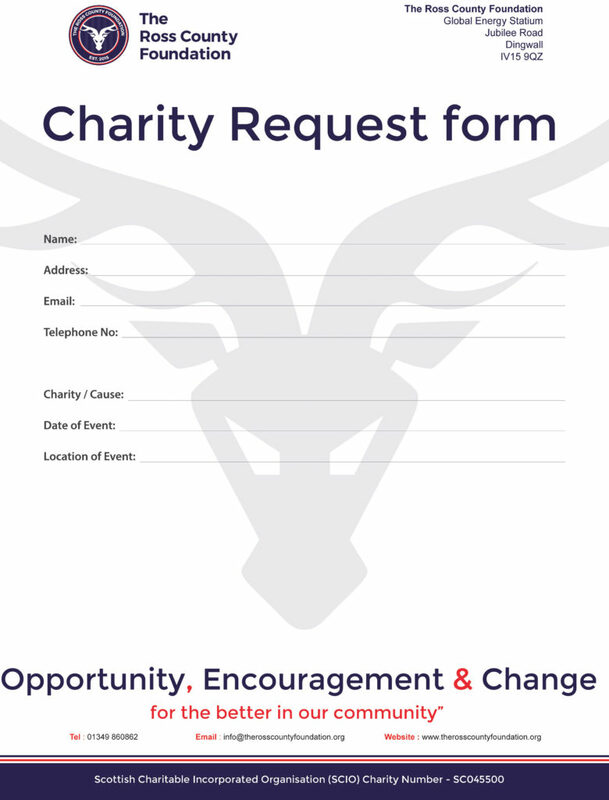 As its charitable activities are focused on the Highlands and Islands of Scotland, TRCF will primarily accommodate requests from organisations based in, or closely associated with, the Highlands and Islands of Scotland. Where it is in a position to do so, TRCF may make special provisions for exceptional cases and may support some national campaigns. Such exceptional support cannot be guaranteed. The appropriate form must be completed and submitted to the correct address or email. Any applications received in a different format or via an alternative route are unlikely to be processed, and are discouraged. A significant amount of TRCF and RCFC charitable activity and support is specifically targeted to support the following types of groups, and that work will continue to develop and increase. When making an application it is strongly recommended that any submission is made well in advance of the monthly draw which is most relevant to the fundraising activity. A random draw will be made on the final Friday of each month throughout the football season. The successful applicants, once known, will be contacted with further details as soon as practicable. Due to the high number of applications received only those who are successful will be notified. Applications will not be carried forward to the following month. Any organisation wishing to apply again is invited to do so.